An oasis of blue, with a glimpse of gold. Royal China. There are places which you will proudly recommend to your friends when they want suggestions for food, and I raved about the best dim sum before. Indeed, my fond memories of the exquisite Chinese-tapas still lingers in my heart. My perennial return was long overdue. But perhaps it was my mistake not to check with the restaurant before going, that I didn’t realise they had a special dim sum menu for the Chinese New Year period. With just a selection of 12 different dim sum, all priced at $6.80++ instead of the normal price, I did feel being rip-off, but that’s Chinese New Year for you, and it was my fault for not checking beforehand. In place of the usual red roe on top of the steamed minced pork dumpling with abalone ($6.80++, usual price $4.80), we had tiny abalones instead. 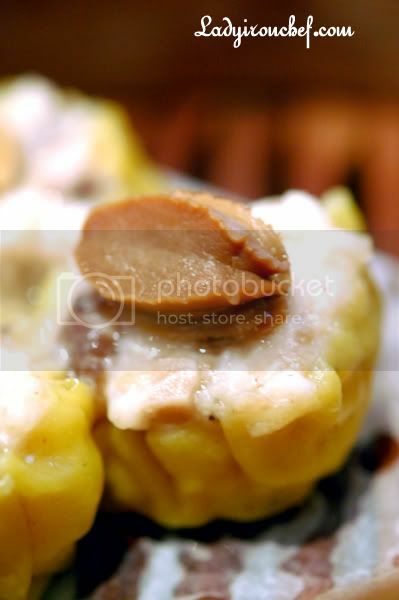 Right, the siew mai was up to standard, but I’ll not say the same having pay two dollars extra for the tiny abalone on top. 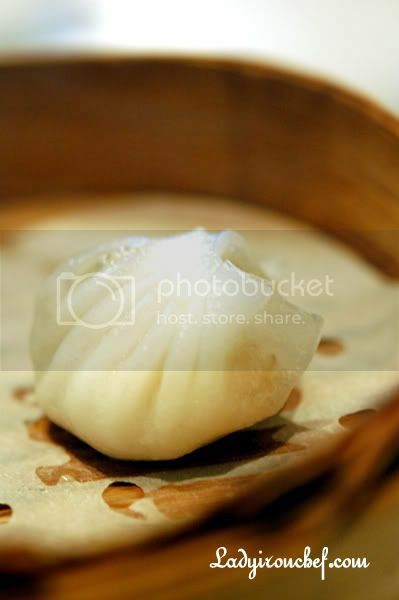 From the outside, the steamed prawn dumplings with black moss ($6.80++, usual price $4.80) looked the same. The exotic ingredients kicked in with the addition of black moss (fa-cai), an ingredient that is never missing from Chinese New Year menu. I certainly understood the significant of the auspicious ingredient, but I must admit that there wasn’t any enhance in the flavour of the har gau. 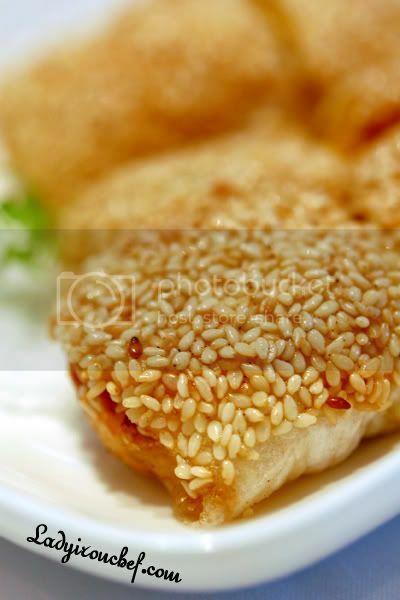 The Crispy prawn rolls with sesame ($6.80++) was one of the item which I did not try before, and I was pleasantly surprised by it. Fundamentally prawn roll with mango, fried crispy with the sesame stuck on top. A dip into the mayo dressing completed the whole taste. 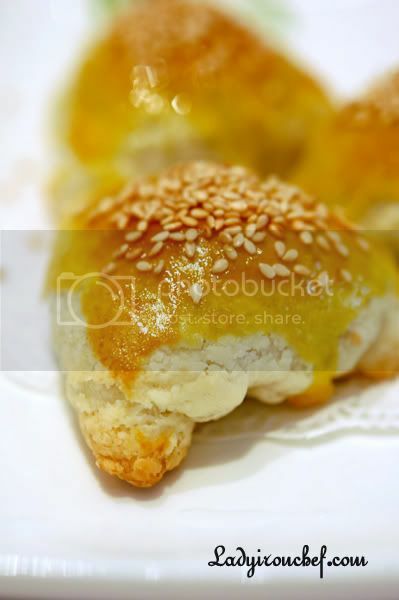 My love, the Baked barbecued pork puff ($6.80++, usual price $4). Royal China’s rendition was very good, with golden butter flaky skin and juicy red char siew. The only problem, this was exactly the same without any addition of “exotic ingredients” and I had to pay almost three bucks more for it. Total bill was $43. 90 for 4 dim sum, 1 appetiser, and of course the other charges. Was I disappointed by the second visit? Certainly, counting by per piece, it’s close to $2.60 each, even more expensive than Yan Ting. But you can’t fault them for the quality in dim sum, it’s just that I’m sore over paying more than usual for my char siew sou. Will I go back again? Certainly, I still have good impression of them even though this was a bad experience. And one more thing which I was not pleased about. For those of you who had been there, you’ll know that in their middle seating area, it used to be square tables with the nice white chairs. But they had removed them, and placed round tables with ugly brown chairs instead. I presumed this was done to increase the seating capacity, but the different furnitures was certainly not pleasing to the eyes, and the seating arrangements were not comfortable at all. After checking with a friend who went after the cny period, it seems everything is back to normal. One thing’s a definite. We will find out the next time I revisit the place. yyn: No! this one is during cny only. their normal dim sum menu is very affordable, like 4-5 bucks for one basket of 4 dim sum? 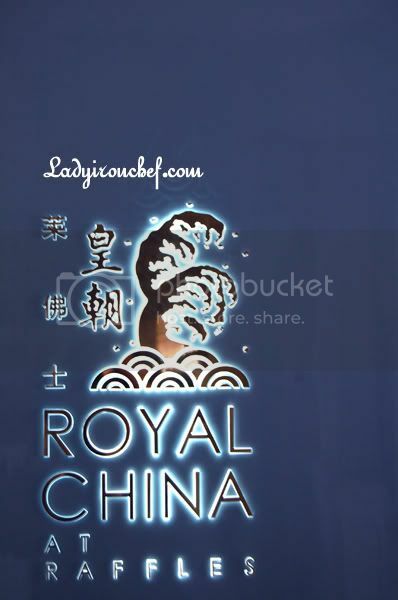 must go and try royal china! royal china vs wah lok. which one better? Still has not tried the dim sum at Royal China. i did have a taste of their main course dishes. And it wasn’t very memorable. I guess they are better at dimsum? The dim sum was good!~ I must go try their main course dishes soon. bumpygrump: Hello there, I’m happy you like royal china too! U should try Yan Ting next, they are as good as royal china, but slightly more expensive. I didn’t try the liu sha pau, have to get it the next time!